According to the English lexicon, the verb ‘to flex’ essentially has one of two meanings. It can mean to show-off, to gloat, or to boast, which is the most popular definition of the word. However, it can also mean to put on a fake front. That set of meaning to the verb ‘to flex’ eminently fits the goings on in Mysuru witnessing the authorities of both the district administration and the civic body issuing press releases along with dos and don’ts virtually ordering citizens in general and traders as well as various outfits staging road shows in particular only to earn the response that doesn’t need any elaboration. Examples such as a) Separate domestic waste into wet, dry and hazardous, b) Don’t toss garbage on roadsides and open spaces at will, (c) Avoid smoking in public places, (d) Wear helmet while riding two-wheelers, (e) Don’t be using mobile phone while driving car, (f) Pay property tax and water charges promptly, (g) Avoid urination against walls of buildings and so on, not to forget (h) Don’t hoist flexes of community leaders spoiling the clean-city-image of Mysuru, make just a fraction of a long list of administration flexing its muscles to no avail. Flexes continue to come up like an avalanche come elections to various bodies including MCC. Littering public space in Mysuru is not a new phenomenon. Old timers of the city can recollect exhibitors of films informing the residents about screening of movies by both high-decibel public announcements and tossing of leaflets with bare details of the film come to town. However, nobody complained nor the administration flexed its muscles, if one’s memory serves right. Thanks to technology, cost of mass producing flexes with a short life of their purpose, as seen virtually all over the city, more in some areas than others, is considerably less than the cost of producing hoardings of large dimensions and allowed to stay in place for several months, if not years. 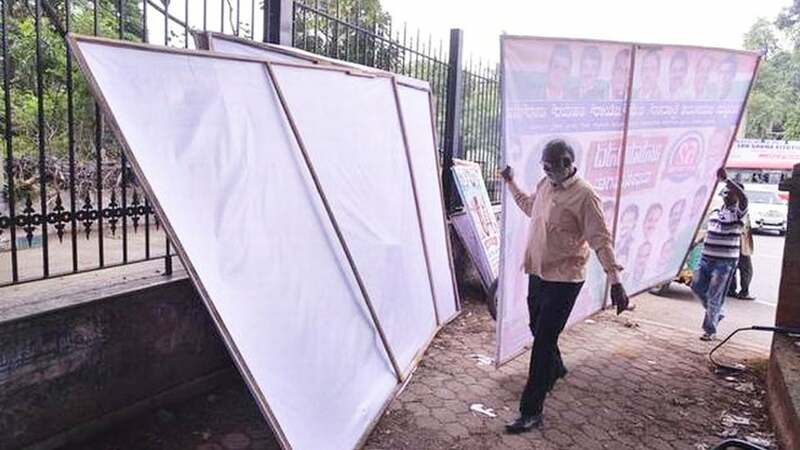 Except for action in fits and jerks by the civic authorities pulling down flexes of all kinds, there seems to be no policy or uniform system governing flex-hoisting in Karnataka, as observed by a Bench of the High Court of the State last week while hearing a batch of public interest litigations, particularly against unauthorised flexes and also hoardings. After reading what transpired between the Judges and the Advocate General, one is prompted to raise an interesting point, namely whether authorised flexes don’t spoil the city’s image? It may be delicate to state that authorising flexes offers one more opportunity to someone to make a fast buck. It is cash that flexes stump flexing, buddy.